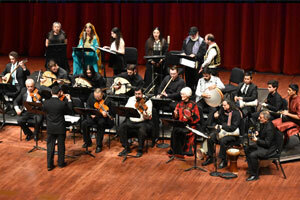 Featuring diverse programs of classic and contemporary music and dance, the Arab Music Ensemble will give three main contrasting shows during the concert season. While focusing on the Eastern Mediterranean, the programs will also feature selections from historically interconnected cultures of the larger region. The instrumental and vocal repertoire will include a variety of composed and improvisational genres that stem from the Middle Ages to the present. Also on the programs will be examples from among the oldest continuously performed art-music genres in the world and the most popular songs in the region. Critically acclaimed guest artists will join the students in the ensemble, bringing their professional skill and virtuosity to the performances and to the educational experience. Colorfully costumed dancers will also join the ensemble to put a variety of selections into graceful motion.